working toward the rights of Dog Owners to know what is being done to their dog in an honest and ethical manner based on science. 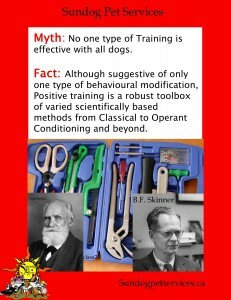 Myth: Dogs who argue are dangerous and will always escalate to do more damage! Fact: Dogs seem to be the only domesticated animal not permitted by humans to tell other dogs when they are being obnoxious. Growling, snarling, and air snapping all tell others to back off. 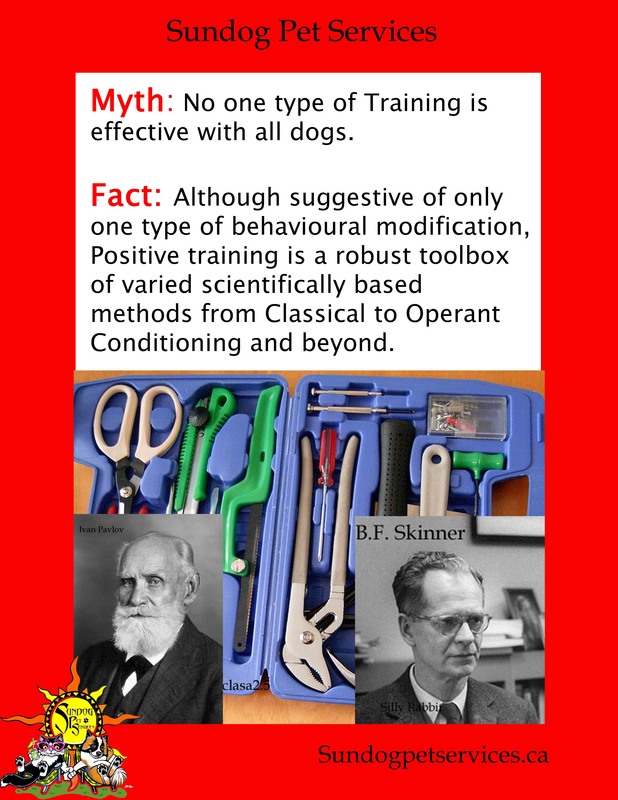 Suggesting these behaviours should be corrected or punished out of a dog is akin to “taking the timer [display] off a time-bomb” (Dr Ian Dunbar) – they are warning signs. Humans argue; rarely leading to assault, damage or death. Dogs argue but they are flashy, loud and trigger primal instincts in humans (sharp pointy teeth directed at someone you care about is scary). Arguing (no intent to cause real harm) is EXPENSIVE for the dog. Energy is required for barking/snarling, posturing and pulled/attenuated bites. Human equivalent is yelling and possibly shoving. Arguing dogs can argue for an extended time usually causing little damage. Full fights take even more energy. Fights (full force, no attenuation – intent to cause harm) endangers one or both parties. Fight damage usually happens within the first few seconds; additional duration can make damage worse. What causes damage in a fight or argument? Poor Bite Inhibition (ABI – Acquired Bite Inhibition) during an argument. Puppies learn to play with soft mouths. Adult dogs are capable of breaking bones yet rarely do. Damage to tender parts of dogs may not be always mean a poor ABI; muzzles, ears and face have thinner skin and bleed profusely making injuries look worse. Repetitive, severe damage during an argument should be taken as a sign of a poor ABI. note: teething puppies can cover their playmates with blood. 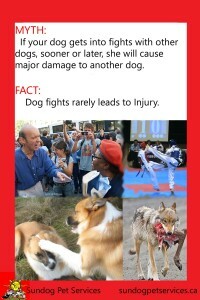 Dogs with fight history (causing damage needing stitches or worse) should be strictly managed. Using a muzzle prevents future damage if an argument or fight happens. Muzzles need not be a sign of shame; they are a sign of owner responsibility. An excellent resource for misunderstood dogs needing a muzzle is The Muzzle Up Project. Attacks “Out of the Blue!” never really happen. Signals may not be seen or have been punished (“corrected”) to a point that attacks seem to occur with no warning. Proactively intercede before an argument if known triggers are present. (Triggers are things that cause the dog to react). Socially inept dogs (poor body language readers and / or those with poor force attenuation) can be trained to understand potential playmates. Keep them from escalating into rough play and teach them not to harass an unwilling dog. Bullies like to pick on one dog in the park (socially inept dogs will play with anyone). Bullies can be trained as well. For both Bullies and Socially inept dogs seek out a competent Positive / Force Free Trainer. Using force, pain or intimidation can potentially backfire and make a dog worse; remember, don’t “take the ticker off the time bomb”. FIGHT! by Jean Donaldson is another excellent resource on how to manage and train these type of dogs.